Russ Baker, founder of the Real News Project and author of this article, is a longtime, award-winning investigative journalist and essayist. His work has appeared in many of the world’s finest news outlets. The Real News Project is a new organization dedicated to producing groundbreaking investigative reporting on the big stories of our time. 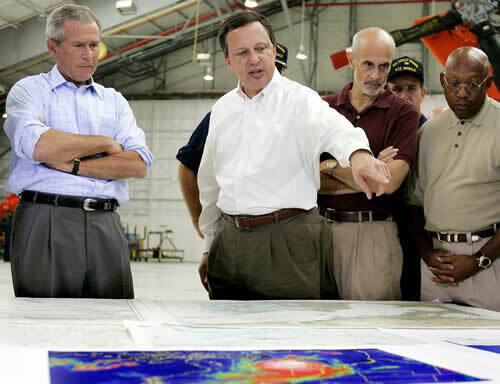 Days after Louisiana’s governor declared a state of emergency and the National Hurricane Center warned the White House that Hurricane Katrina could top the New Orleans levee system, the only FEMA official actually in New Orleans itself— Marty J. Bahamonde —was not even supposed to be there. He had been sent in advance of the storm and had been ordered to leave as it bore down, but could not because of the clogged roads. Michael Brown, the head of FEMA, was known to have made it to Baton Rouge but seemed out of reach. A week later, Brown would be replaced as on-site manager of the disaster. Blamed for his role in one of the largest domestic debacles in American history, Brown was still thinking of his own comfort: "I'm going to go home and walk my dog and hug my wife, and maybe get a good Mexican meal and a stiff margarita and a full night's sleep," he told AP. In the midst of America’s worst natural (and manmade) disaster, it became clear that Brown was indeed lost in Margaritaville. Indeed, as soon as Allbaugh left the agency, he began cashing in. Today, both Allbaugh and Brown are consultants, making money off their connections at FEMA and in the administration—tattered and tarnished though their legacies may be. And now FEMA is staffed by others put into position by the two men and run by David Paulison, best known for having advised Americans to stock up on duct tape as protection against future terrorist attacks.